Sour Patch Kids are the perfect movie theater treat. You can easily sneak ‘em in and enjoy that addictive sour and sweet combo during a screening of, say, Transformers 27: Transformers Transform Into Things Again. Despite that, there’s one major drawback to Sour Patch Kids: you can’t pour milk over them and eat them for breakfast. Well, have we got some good news for you! 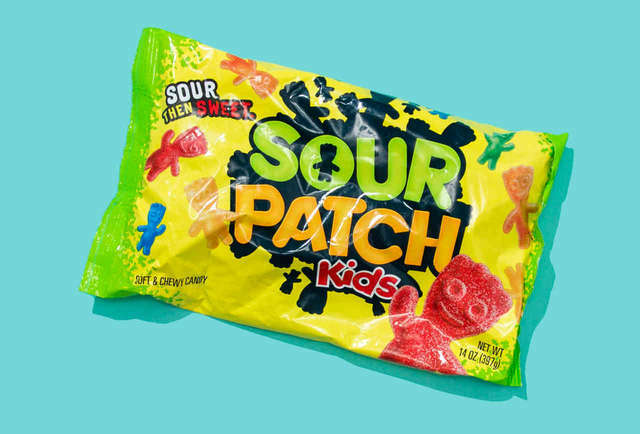 Post Consumer Brands -- the same company that brought Fruity Pebbles and Honeycomb to your kitchen table -- has released Sour Patch Kids flavored cereal. Fans of sour milk -- shameless monsters, all of you -- rejoice! Rumors first started floating around in late October when the Instagram-famous @CandyHunting posted about the cereal. While they admitted it could be a Photoshop (it’s not! ), they rightfully concluded that “Post has already released several other cereals in conjunction with Mondelez, so this is likely another collaborative cereal between them.” That’s why you’ve seen Post debut cereals with other Mondelez-owned brands like Chips Ahoy!, Oreo O’s, and Nutter Butter. Could Trident, Wheat Thins, or Toblerone cereals be far behind?! Then all cereal-based hell broke loose when Cerealously, a fine news and review site, broke the news that the cereal was real. The bad news? The site's founder Dan Goubert says you might have to look around hard for it, as while some people have been able to find it, he hasn’t been able to track any down. And that man runs a site named Cerealously! While people have been debating on Instagram and Twitter whether or not the cereal will result in sour-tasting cereal milk (in our opinion: unlikely... sorry weirdos), not enough people have actually tried it to weigh in. Whether the cereal becomes the next Reese's Puffs or goes the way of Pop Tarts Crunch remains to be seen. Either way, it's still not advised to eat cereal in a movie theater. Especially if the movie is A Quiet Place.